History: Société Belge de Transport par Air (SOBELAIR) was formed on July 30 1946 as a charter company and was formerly known as Société d'Etude et de Transports Aériens (SETA) till November 12 1946. First revenue with a DC3 went from Brussels-Haren to Nice via Paris on October 15 1946, carrying a load of flowers. Between 1947-1954 scheduled services were maintained between Belgium & Belgian Congo (Elisabethstad). From 1949 on SABENA took a major stake in Sobelair. Between 1957-1960 local feeder services for Sabena with three Cessna 310's were maintained within the Belgian Congo. From 1960 on, Sobelair's core business was to operate worldwide non-IATA charters and IT flights, but made between 1968-1973 also some scheduled intra European feeder services with a Fokker F-27 on behalf of Sabena. The jet age was entered in 1970 with the purchase of Caravelles, from 1978 on replaced by B737-200s. Medium to long haul services were maintained by B707s, the first one was leased from Sabena in 1974, during the eighties & nineties replaced by B737-300/400/800s & B767-300s. From the eighties on, additional equipment from various foreign sources was leased during the summer seasons. Sabena, which held a stake of 72% in Sobelair, went bankrupt in November 2001. Afterwards a new investor was sought and found with Aldo Vastapane. One of his top priorities was to establish a scheduled link Brussels-Johannesburg. So on November 25 2002, after an absence of almost fifty years, Sobelair was back in the African business. But it turned out to be a loss making link and was already abandoned by July 2003 (also under pressure of aircraft lessors). A contract with Dutch Carribean Airlines was signed to operate charters between Schiphol and Curaçao. One aircraft "OO-SLT" was painted in their colors and came into use from May 2003 onwards, but this was also a very money loosing adventure. 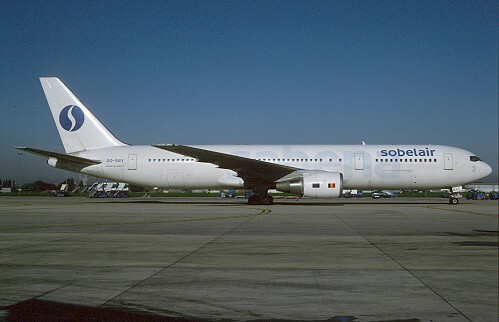 When in the same year some tour operators took initiative to create their own airline, the poor financial further escalated, ending Sobelair's story on January 19 2004 with the bankruptcy.